Throughout history, the Lord has commanded His people to build temples. A temple is a place where holy ceremonies and ordinances are performed. It is a place where the Lord has revealed Himself and instruction is given to help the sons and daughters of God gain eternal life. It is literally a House of the Lord. At the time of Jesus Christ, the Temple of Herod at Jerusalem was the center of religious life and learning for the Jews. A thousand years before the Savior, Solomon's Temple was the crown jewel of Israel's greatest age. But even Solomon's Temple was modeled after another. By going further back in time to the days of Moses, we can see a type of portable temple used by the children of Israel in the wilderness: the Tabernacle. The Tabernacle, like the temples that followed it, was the place where the children of Israel learned the way to eternal life. Let's take a tour of the Tabernacle and see what we can learn. This gate in the east wall is the only entrance and leads to the outer courtyard. This courtyard might represent the telestial world we live in. 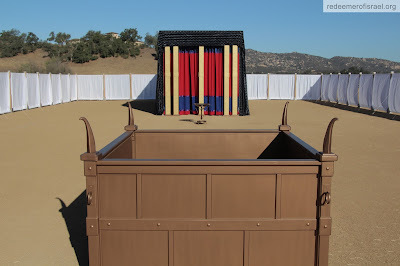 Within the outer courtyard and in front of the tent of the Tabernacle are the Altar of Sacrifice and the Laver. The Altar of Sacrifice is where burnt offerings were made to the Lord, symbolizing the suffering and death of the Savior on the cross. Here at the altar, Israelites made offerings that represented their faith in Jesus Christ. Through repentance, symbolized by their offering the animal to God, and their life and obedience, they would prepare for the cleaning power of the Holy Spirit. The Laver is made of brass and contains water. Officiating priests were required to ritually wash here before entering the tent of the Tabernacle. The Laver represents the need for washing and cleansing of souls from sin, and could represent the waters of baptism. The tent of the Tabernacle is made up of two rooms. The first room, called the Holy Place, contains the candlestick or Menorah, the Altar of Incense, and the Table of Showbread. This Holy Place might be seen as the terrestrial world, and taught Israel how to be in the world but not of the world. The Menorah provided light for the Holy Place and was kept constantly burning. It symbolizes the Holy Ghost and emphasizes the need to live by the light of the Spirit in this life. On the Table of Showbread was kept 12 loaves of unleavened bread, which were eaten by the priests every Sabbath. Jewish tradition holds that a pitcher of wine was also kept on the table. The bread and wine on the Table of Showbread reminds us of the bread and water of the Sacrament. It suggests the Savior's sacrifice for us as well as the need to be spiritually nourished by Him. 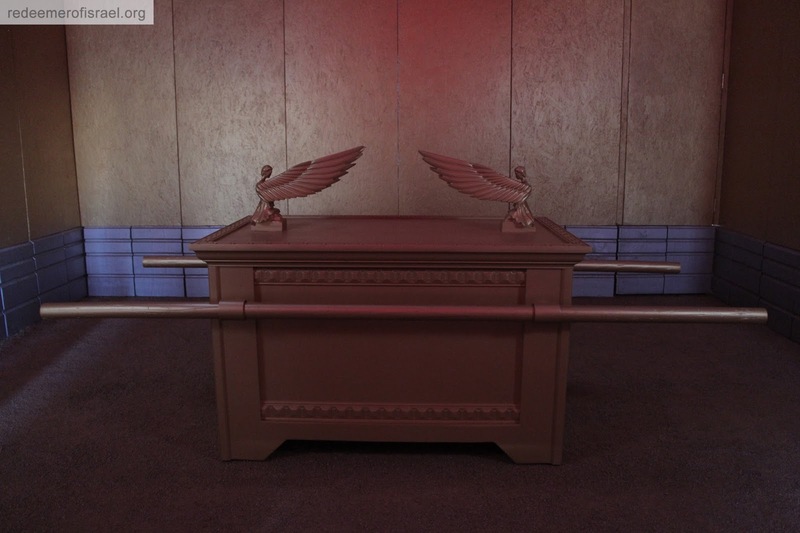 The Altar of Incense sits in front of the entrance to the Holy of Holies. Each morning and evening, the High Priest burned incense here. Incense is a symbol of prayer, just as the smoke from the altar rose before the veil every morning and evening, so Israel was expected to raise their prayers regularly before the Lord. The altar's position before the Holy of Holies also shows the importance of prayer in preparing to enter the Lord's presence. The linen veil separates the Holy Place from the Holy of Holies. Embroidered on the veil are figures called cherubim, which symbolically guard the presence of God. We now enter the Holy of Holies. The Holy of Holies represented our ultimate goal of living in the very presence of the Lord in the celestial world. 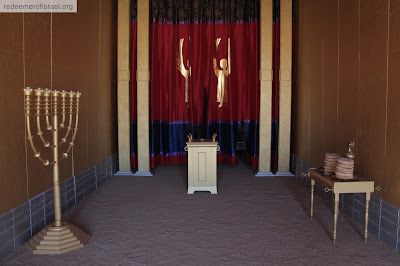 The High Priest entered this room only once a year on the Day of Atonement. 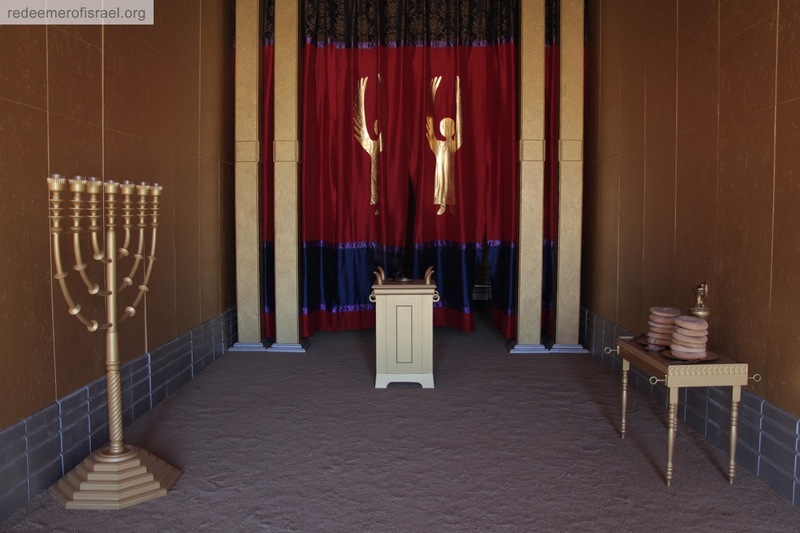 In the center is the Ark of the Covenant, the most sacred object in the Tabernacle. Inside the Ark are kept other sacred objects, including Aaron's rod, a bowl of manna, and the stone tablets of the Law given to Moses on Mount Sinai. The tablets reminded Israel that their return to the presence of God was based on their obedience to His laws and ordinances. The lid is called the mercy seat, or seat of Atonement. It is made from pure gold and features two cherubim. On the Day of Atonement, when the High Priest entered the Holy of Holies, he sprinkled blood from the Sacrifice on the mercy seat as part of the ceremony, symbolizing that through the blood of the Lamb of God, Israel obtained mercy and the opportunity to once again live in God's presence. The Tabernacle and its furnishings showed Israel the path that leads back to our Father in Heaven. The outer courtyard represents coming to the Savior from out of the world. The Holy Place represents living by the Spirit in this fallen world. 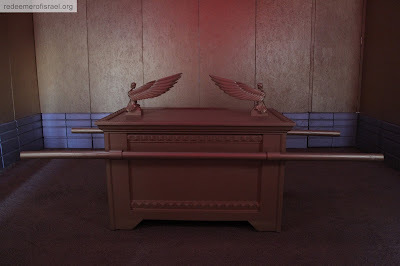 The Holy of Holies and the Ark of the Covenant remind us that, through the atonement of the Lord Jesus Christ and obedience to His covenants, we can return to the very presence of our Father in Heaven. Text modified from the video The Tabernacle.